Fox River steamer FLORA WEBSTER (1872). Original engines from FLORA WEBSTER (1872); two high-pressure direct-acting. 8 x 16 at 86 pounds pressure firebox boiler, Robert Davis, Milwaukee, WI (1880). 1880, Jun 18 Enrolled Milwaukee, WI. 1881 Recieved machinery of propeller CITY OF TOLEDO (1868); low- pressure engine with 32" cylinder, 30" stroke, made single-screw. 1882, Nov Engines compounded by James Sheriffs, Milwaukee; made steeple with 19 & 32" cylinders, 30" stroke, 300hp at 80rpm. 1883, Aug Damaged in storm. 1887, Jun Ashore at Fox Point in fog north of Milwaukee, towing C.N.JOHNSON & WM.JOHNSON. 1888 Collision with ferry SALLIE at Cheboygan, MI. 1889 Scorched by fire at Milwaukee. 1895, May 4 Owned John Burnham et al, Milwaukee. 1903, Apr 20 Enrolled Milwaukee; owned Adolph Green & Frederick Schwerman, Green Bay, WI. 1904, Dec 29 Enrolled Milwaukee; owned Adolph Green. 1907, Feb 21 Owned G. B. Shaw & A. T. Naugle, Chicago, IL. 1912, Mar 20 Owned Naugle Pole & Tie Co., Chicago. 1914, Aug 24 Owned Acme Sand Co., Cleveland, OH; converted to sand sucker. 1921 Dismantled at Toledo, OH. Email your Order Comment on this item Create electronic postcard Loading cedar ties. 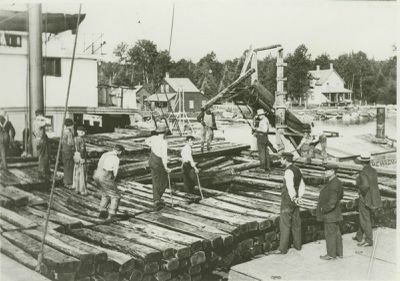 Loading cedar ties. detail Cedar ties. Loading cedar ties from raft. Loading railroad ties. Carrying square timber.